Our trip to Peru inspired me to try some South American cooking. We had some amazing food in Peru, and that is not even considering the fact that most of it was carried up and prepared on the Inca Trail by Chaskis. This dish is not necessarily Peruvian, but it contains many of the ingredients that are commonly found in my “Inca Trail Cookbook” that I purchased in Aguas Calientes. Sadly, I don’t know that I will ever do much cooking directly from the book because a lot of the techniques and ingredients it includes are not easily/properly translated to English. Unfortunately, this is another dish that tastes way better than the photograph looks. I think there is a common theme here, maybe the photographer. Anyway, here you have it, Lentil Salad with Roasted Sweet Potatoes and Queso Fresco. Peel and cube sweet potatoes, chop onion. 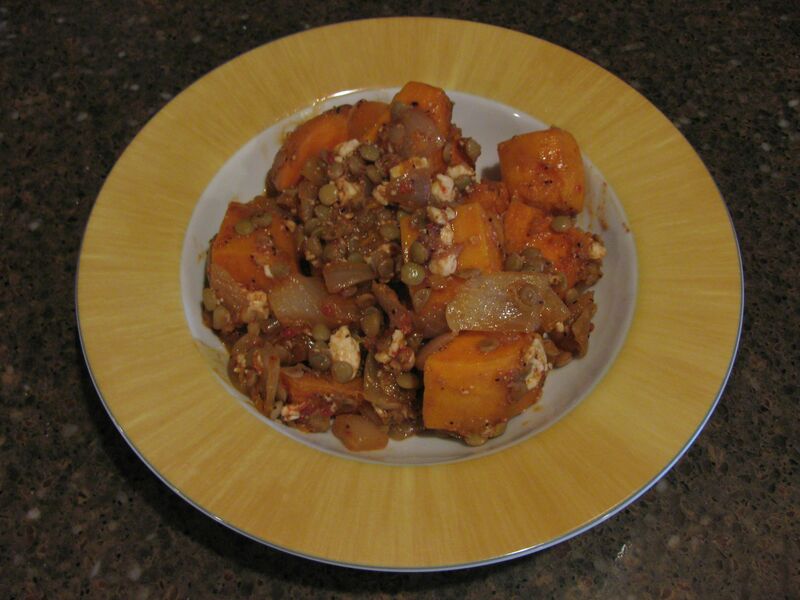 Toss the cubed sweet potatoes and the chopped red onion with 1 tbsp olive oil, cumin, paprika, salt and pepper. Place vegetables in a roasting pan and roast, gently stirring every 10 minutes or so, until potatoes are tender. Mine took about 40 minutes total. While potatoes are roasting, bring the lentils to a boil in about 2 cups of water. Simmer lentils gently until tender, about 25 minutes. Drain lentils well, and let cool completely. Place lentils in a bowl and toss with 1 tbsp olive oil, 2 tbsp balsamic vinegar, and the juice of one lime. Stir in the sweet potatoes and onions, roasted red pepper, and queso fresco, and gently toss to mix. I really enjoyed this dish, but next time I might change it just a bit. I will double the amount of balsamic vinegar but make a balsamic reduction before I mix it into the dressing. I was hoping to have a little bit sweeter (and less acidic) of a flavor and I think that would do the trick.